This entry was posted on July 6, 2013 by Robyn Lee. It was filed under Nature, Romance, Spiritual, Summer 2013 and was tagged with bicycle-ride, edible flower, enticement, flowers, honeysuckle, infuse, intoxication, Lonicera Japonica, Love, nature, photography, poetry, promise, rhyme, Robyn Lee, Romance, sedcuction, spirit, surprise, sweet, unexpected. Thank you dearest Penny! Yes – this poem is based on the true experience I had this week with these beloved honeysuckle flowers in my image… not sure anyone will believe me – but truly did occur. I was riding my bicycle and suddenly this aroma took me over ~ had to stop and surrender to the seduction of these blooms – of course I had to EAT one too! 🙂 ~ Really – True Story! Intoxicating it was! Love to you — and yes… I should be sleeping, I know! You certainly did one of my favorite plants justice as did it do your words the same and then some more. 🙂 YUM! Great poem, Robyn. Even better on second reading with the description of your bike ride in the comments section. Truly words that are too sweet for bees, as always R, your words flow like the flowers they perceive . Yes Yes B – there were so many bees feasting on these sweet treats, but they would not pose for my camera 😦 ~ 🙂 Thank you so much for your thoughtful words which always warm my heart. I hope you are back from your painting tour, settled home safe and sound by now. Yes, thank you I am. Also up late with the excitement o being home and the sadness of having to leave. glorius…the word just keeps running through my head. Oh yes! I’m all in a swoon of delight! Beautiful image Robyn; both the visual and the emotional. Yes, I tend to shy away from the reader (too much to see at once)… and I like the lack of competitive windows found with the email notifications. 🙂 Yes close your eyes and describe a sunset………. 🙂 Love you. To intoxicate as your last line says….well you certainly have, this is such a wonderful piece conjuring not just evocative images…but also scents and sounds…definitely the definitive summer poem! Beautiful fusion of words and image! Loved it! That’s a gem, a glorious gem. A lyrical play of the “mysteries of the unknown” known only to intoxicated hearts. O wonderful Robyn, this sure brought a smile to the lips, as I can see the sun rising gently through my window right now. Certain a wonderful day it shall be that started with a poetess’s finest tapestry. You, my dear, always leave me thirsty for your next offering. Have a great time ahead. Sending you a bouquet of Maldivian sunshine… and love. Oh no — sf – you are not drunk over there in the Maldive Islands are you?! I would feel so guilty! 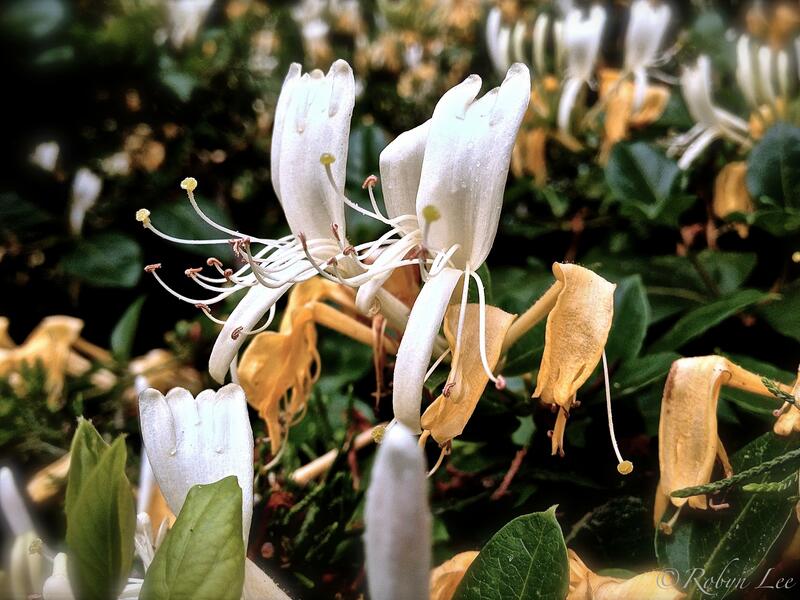 🙂 Teasing of course … as these honeysuckles could only promote the most blissful state of being! 🙂 I am so happy to see you , and know you enjoyed this. Thank you so very much for this lovely thoughtful comment- can see your smile clearly too – very beautiful. This poem is, yet , another kiss gifted from your generous soul. It’s not a wonder you are adored. Nice……here’s wishing all the joys of summertime come to you. Robyn, this is such a beautiful post.. I could actually picture myself in the woods.. surrounded by intoxicating, sweet scents..
And the photograph is the kind that one would want to look at to beat the blues.. it has an inexplicable calming effect..
OH BOY, OH BOY!!! HOW WELL I REMEMBER!!! This is beautiful – Love it! So very delicately romantic! It softly whispers the warmth of love in such a sensitive and lovely way! Beautiful Robyn, I love the way you deliver what is always alive in your heart and spirit! Have a wonderful day my dear sister!!!! Blessings and hugs always! Your words always remind me, Robyn, there’s a softer side to each day. Thank you. Rahul Ashok is OVERJOYED now. Wow, Robyn! This is wonderful! It grabs you and pulls you right in. Fabulous! The scents you evoke with your beautiful poetry and the imagery you create with your photography are both quite intoxicating Robyn.